Key questions for growing organizations: What’s your identity? What’s your story? Associate Director Ekin Yasin’s inaugural course offering pairs students with local companies to refine their organizational identity. We’re living in an age of identity. Most of us have a clear idea of who we are and what we believe in as individuals. But these days, it’s just as important for organizations and businesses to know the answers to those questions. A well-formed organizational identity is the backbone of how a company communicates its story and values to both external and internal audiences. That intangible concept of the “who” and the “why” of a business can motivate employees and steer strategy to a very tangible result — but only if the organization also understands the “how” of communicating those values and telling their story. Take REI. Its now famous and oft imitated decision to shutter stores on Black Friday originated from an internal message to employees. The Co-op leaned into its values of spending time outdoors and respect for its members, and walked away from the biggest sale day of the year. Powerful storytelling and a newly minted #OptOutside hashtag helped the decision go viral, and REI quickly had its risk repaid with cascading affirmations of customer loyalty and national brand recognition. By allowing their crystal-clear identity to guide and communicate their strategy, REI transformed #OptOutside sentiments into hard cash in the register. 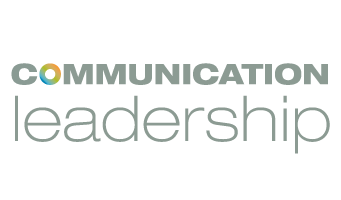 Yasin’s inaugural class offering at Comm Lead, COM 546: Communication Through Digital Media & Networks: Organizational Storytelling and the Digital Age, keys into these concepts. 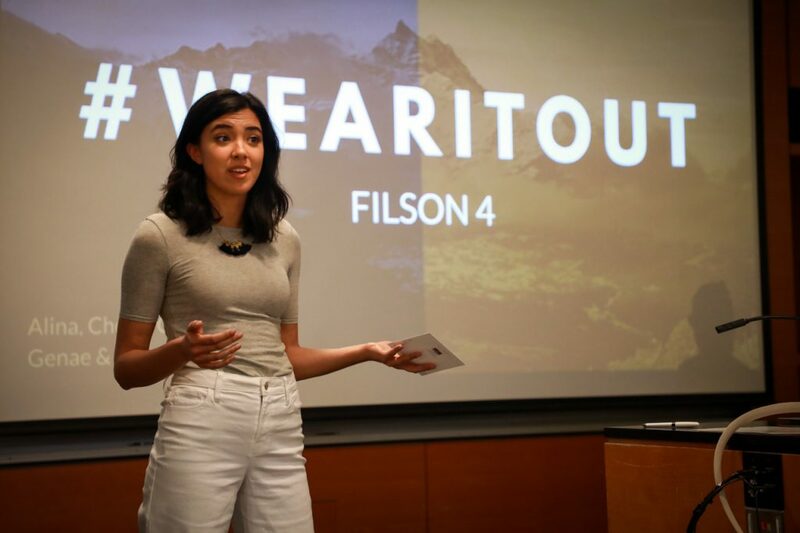 Cohort 16 student Cristiana Ventura presents her team’s plan to clients from outdoor outfitter Filson. It’s a core course taken by all students in both of our degree programs, and builds on the program’s first core course, which helps students identify their own personal leadership style. This second core course tasks them with taking the next step — understanding, analyzing, and strengthening the identities of institutions larger than themselves. “We offer a strong curriculum about how to produce and tell stories for organizations… I wanted to create a supplemental course that will give them the assessment skills and awareness of who organizations are,” explained Yasin. 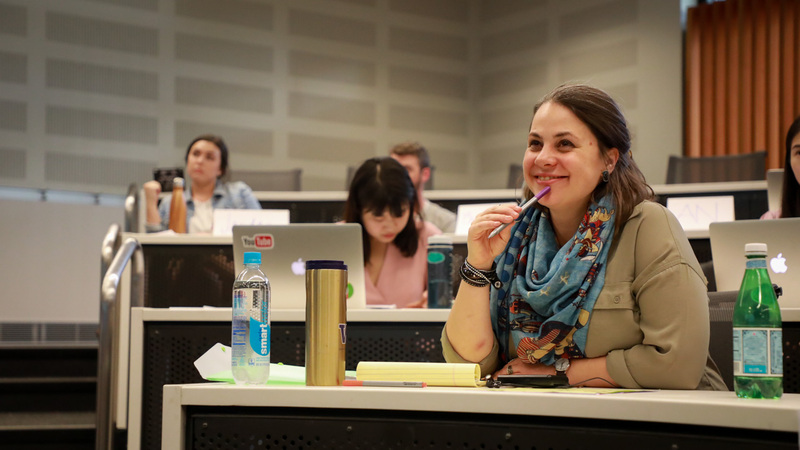 Students in COM 546 got to hear these organizational identity success stories straight from the mouths of those who envisioned them — a star-studded roster of guest speakers from Starbucks, REI, Microsoft, and the UW Alumni Association. The course’s defining mission was for students to apply those theories and perspectives to a solution for a real-life client. Three organizations — each with a unique organizational identity challenges — partnered with the class for this purpose: Filson, a legacy outdoorsman brand that needed to capture new, younger customers; WE Communications, a public relations firm that wanted to expand its identity to better reflect the variety of clients they work with, and FareStart, a nonprofit that provides culinary job training for low-income populations, that struggled to engage its growing alumni community. 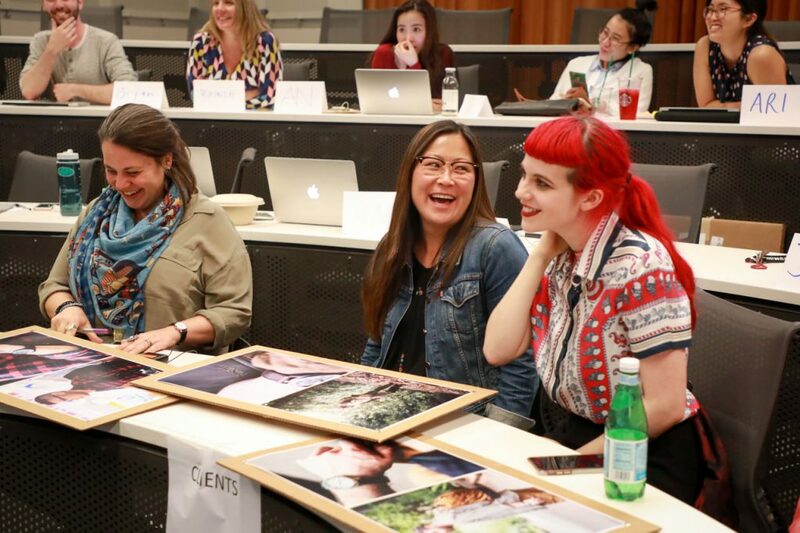 Prof. Ekin Yasin (left), Filson Marketing Manager Amy Terai, and Social Media Manager Emily Cripe react to a student presentation. The client organizations were each paired with four different student teams who assumed the role of consultants to deliver a concrete communication strategy. Their processes weren’t uniform — instead each team’s effort was in direct response to the client’s challenge. For some that meant drawing on website analysis, for others it was in-person interviews with company employees. But across the board, teamwork was of the essence, both within students teams and between teams and clients. Cohort 16 rose to the challenge – and relished the opportunity to work with real organizations. For COM 546, that final step was a competition-style presentation day where they unveiled their recommended strategies. 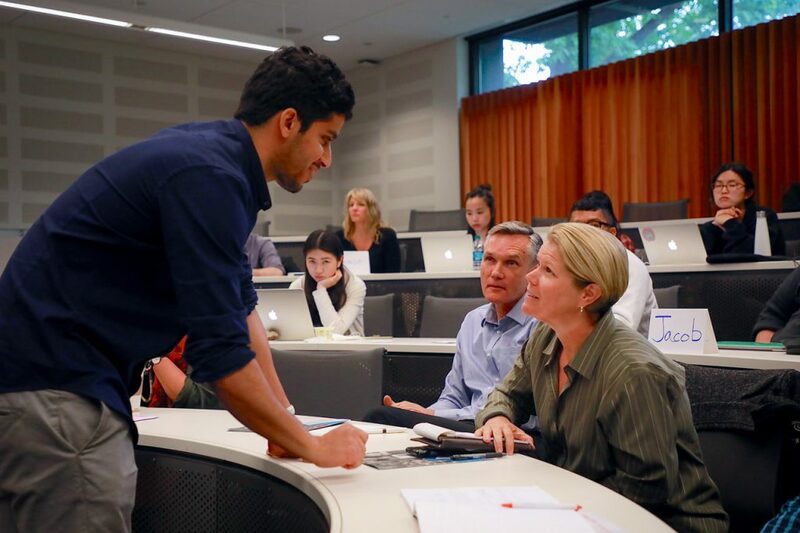 On the last two days of class, student teams pitched glossy, well-researched solutions to a judge panel of representatives from Filson, WE, and Farestart. The presentations were a test of multiple competencies: how well the students understood the organizational identities of their clients in the first place, the quality of their proposed solutions, and the showmanship and storytelling required to convey all that to a room of 60 people in 15 minutes. Cohort 16 student Fahad AlDaajani approaches FareStart’s Chief Development Officer Michelle McDaniel and Director of Employment Programs Eric Boutin. After each set of four teams presented to their assigned client, the class anonymously voted on best in show. “To present and see the reaction in the room – it was confirmation that yes, you put everything you learned and everything you researched into practice and it all came together,” said student Genae Lako after finishing her presentation. When dust had settled, every single COM 546 student walked away with direct industry feedback on their work, an organizational identity strategy for their portfolios, and acute insight on how organizations big and small can shape their identities to respond to global trends.